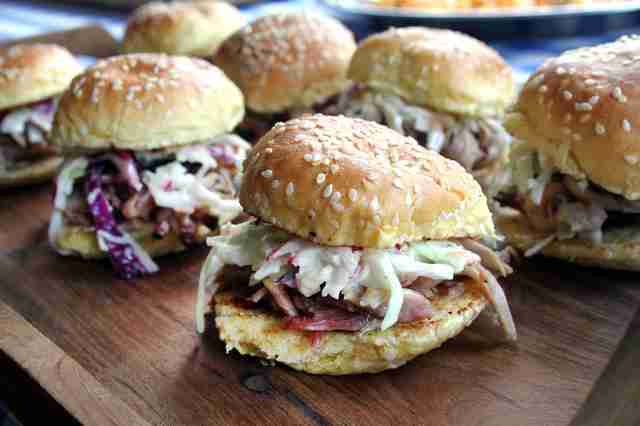 Real talk: Despite what anyone’s told you, there’s no such thing as “Atlanta-style” barbecue. 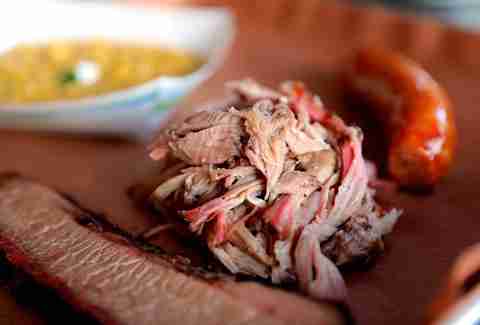 And for that reason, some people think barbecue in Atlanta isn’t as culturally ingrained or important to its residents as it is in cities like Austin, Memphis, Kansas City, or other towns known for their local methods of preparing deliciously smoky, slow-cooked meats. But that’s because those same people probably have only eaten at random, mediocre Atlanta BBQ spots -- the kind of places where you end up having a nice dinner conversation instead of filling your gullet with sloppy, saucy, heavenly meats. That said, instead of judging you or your favorite default smokehouse, I’d rather tell you where to go in Atlanta for legit, can’t-miss, can’t-diss plates of unforgettable barbecue. In Atlanta’s pork-saturated marketplace, it’s refreshing to find people who take pride in the bovine side of barbecue. Served with a perfect “bark” of smoky, crunchy meat, CQ's bones aren't just giant, they're also better than that episode where Booth and Dr. Brennan find so... err, well, better than any episode of Bones, actually. For many years if you asked anybody who had the city’s best barbecue, you were going to get a few familiar names (many of which are still here on this list). But from the coals has emerged a newly recognized leader, pitmaster Brian Furman, who can pimp a brisket as good as K. Dot says our country pimps butterflies. B’s not only made a name for himself with his food, but he’s challenged the local barbecue power structure with his own new-standard-setting style of preparing pig, chicken, cow, and otherwise. 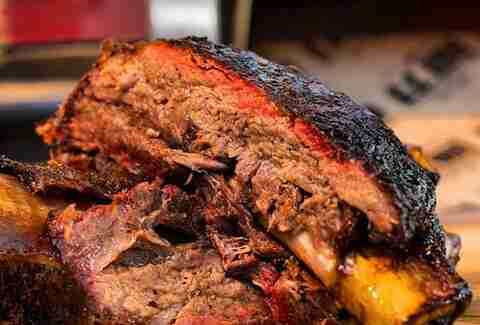 But if there’s one thing you must choose over all, get the brisket; those signature beef slab slices are upper-echelon. He’s also respected for keeping his pigs heritage-style instead of whatever comes off a refrigerated truck (they’re “his” pigs -- one of his partners raises them in Statesboro). And with enthusiastic persuasion from regulars that include their Riverside neighbors, on up to super-ATLien Killer Mike, B has become a serious tastemaker looking to expand much further than ATL and Savannah, where he and his wife Nikki began. With no real seating (standing room only on the patio), and almost no parking, you’re going to order at the counter, and may have to wait outside, too, but their Korean-Southern hybrid Q is worth it... and so is the hassle of eating it while perched on the hood of your car, or sitting on one of the piles of hickory stacked outside, or wherever. There have been many great kings over time -- MLK, James (as in LeBron), Koopa, a.k.a. “Bowser” -- but a new question must be asked: Has a new member of the royal bloodline been identified, and will it come to rule all, from the cushy locale of Avalon? That depends not only on whether you live OTP north, and if you like barbecue more than traffic, which is something partners Shaun Doty, Lance Gummere and Carey Wise believe you will. With combined experience that includes Fox Bros, Grand Champion, The Shed at Glenwood, Bantam + Biddy, The Federal, YEAH! Burger and more, the three-man crew hopes to hold court for breakfast, lunch, and dinner, from cheddar biscuits to ⅓-pound lunchtime pork sandwiches, daily rotating meat specials, and live music to accentuate. The criticism of GCB’s meat is that it is sometimes "too delectable." It's like when you tell your boss you’re “too hard of a worker.” But don’t worry, once you make it past the smoker by the door, if the ribs you order actually fall off the bone, you’ll have some of the city’s creamiest mac and cheese to help catch it. If you know someone that works for Delta’s corporate office, ask them about Pit Boss, just down the street from them on Virginia Ave. 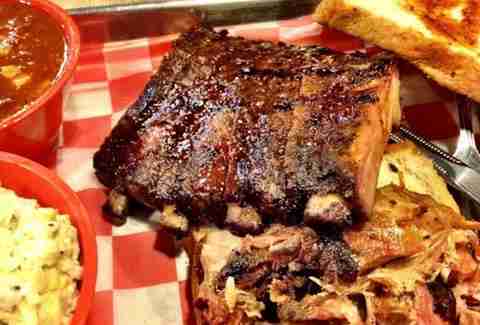 They might look at you as if you’ve asked them about Skull & Bones, because PB is one of ITP south’s best kept secrets that isn’t as hungry for new customers as you are for ribs. And you’ll be hungry for theirs, over and over again, as well as their chopped chicken sandwich, brisket, and some of ATL’s best wings (smoked & fried; get the lemon pepper). Fair warning: they run out of certain popular items sometimes, so don’t wait until two hours before closing time to call in your order, especially on a Friday night. 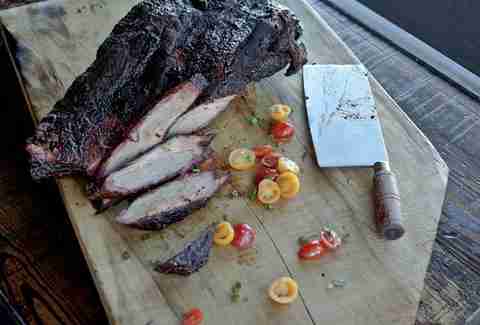 The wood really does matter, and at DAS, you can taste more of the hickory and pecan wood flavor than you do smoke. They way they do: meats in the smoker for five hours, then a rotisserie overnight. This results in juicy, delicious Texas-style brisket that’s never too dry or tough. DAS is also one of the few ‘cue joints in town that has vegetarian sides as well as meat-cooked ones, including mac and cheese, collards, and potato salad. Why you’d be at a barbecue restaurant but not want meat is a question that slow-cooks my brain, but hey, it’s your money, belly, and happiness. Just eat whatever they cook and you’ll be fine. 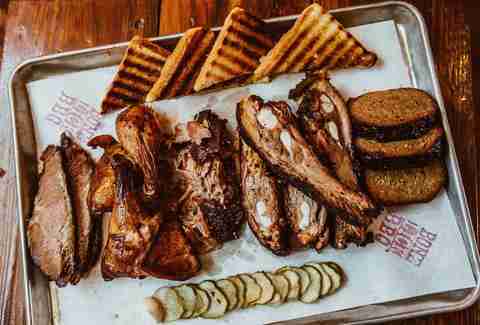 Jonathan and Justin Fox are long-running ATL favorites when it comes to standard-bearing barbecue. Their original location on DeKalb Avenue rarely has a parking spot (consider the 'cue a reward for the short walk to/from your car on Josephine or Elmira), and that's because the Texas-style brisket, immaculately smoked chicken (get the wings), and consistent quality of pulled pork sandwiches, sides, and all else make for one of the most bankable BBQ experiences you can have in Atlanta, which is why you'll hear more people suggest Fox Bros by default that pretty much anywhere else. What other local BBQ spot has a strong enough reputation to brew a beer with SweetWater (the bacon-/hickory-smoked Pulled Porter), and be the beer of choice pouring in the Terrapin Taproom at SunTrust Park? Not to mention, FB BBQ is the Falcons' and ATL UTD's official BBQ. They've been around since 2007 and won't be going anywhere anytime soon. Not even two years old, this Mike LaSage-helmed, and David Cross (yes, Tobias Fünke)-backed spot isn't screwing around when it comes to smoking, frying, or all-out BBQing. And while the meat is spectacular, the introduction of things like fresh, fried pork rinds, their pork belly BLT, and next-level pork-n-pork-n-beans to Atlanta's BBQ scene is a welcomed development. They were once labeled as underrated, but it’s time to give SAB the love it deserves. 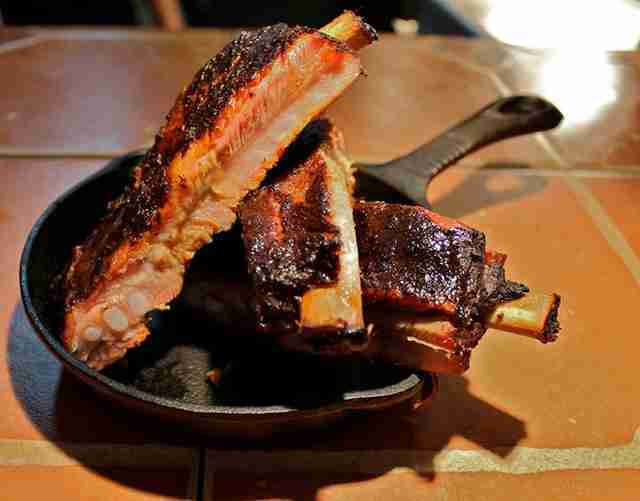 It is, after all, one of the most consistently delicious spots for eclectic ‘cue in town. Not a lot of restaurants in town could legitimately pull off Memphis baby back ribs, Korean spare ribs, a huge “dinosaur bone” beef rib, sweet and sour “Wu-Tang” brined/smoked/fried wings, and homemade banana pudding under one roof. When your name is so aligned with the law of attraction, you have to come correct with sauce. TGG knew what it was doing, and knew it was on solid ground in terms of humble-bragging with their barbecue, because the team behind it stands on its Buckhead and Tucker locations’ reputation of stellar brisket, amazing smoked wings (the rub is thick and worshipful), and baby back ribs tender enough to be an R&B album. 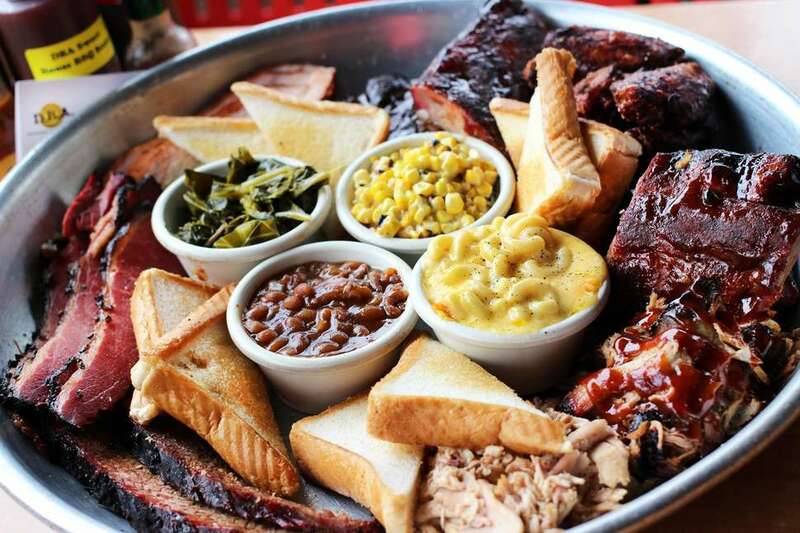 They’ve recently expanded to both East Lake and a Westside locale on Howell Mill, which if we’re talking about things that symbolize a place whose barbecue isn’t just good but actually greater than you’d expect, ain’t a bad sign at all. DBA’s kitchen is so insane they could likely start putting out actual smoked porcelain plates covered in sauce and they’d sell out on G.P. Using hickory on twin Southern Pride rigs, DBA smokes exceptional wings, wet and dry ribs (St. Louis or baby-back), 15-hour Angus brisket, apple-brined pork chops, and more. They also have great events (monthly BBQ-sauce-making classes; adult trivia on Thursdays...), and a weekend brunch which includes beignets, smoked/fried chicken and waffles, brisket hash w/ fried eggs, and a fried green tomato ham Benedict on grilled challah. Mike Jordan eats at Pit Boss most often because he lives nearby, an honestly thought B’s Cracklin’ should have won Memphis in May’s championship competition this past year. But he loves all good barbecue, and will tweet about it from @michaelbjordan, with occasional pics posted on IG from @mikejordanatl.